Thread: Anyone in the Ktown area? Just seeing if anyone is around the ktown/Ramstein area. With summer pretty much here would like to get some people together for some local crusies/ track days. Not in the Ktown area but come up occasionally on TDY. Will try and give you heads up when a trip is planned and you can do the same if you ever head down to Italy. Sounds good! I'm actually planing on making a trip to northern Italy later this summer. I'm in Wiesbaden as well. Trying to find some like minded people for cruises/track days. Im at Sembach; new to country. Actually looking to buy an audi - I'd appreciate any leads. I prefer buying from forum members - who are typically car-people...about 7000 Euro budget. Just moved to K-Town. Just PCS'ed from AZ. Have a 2016 S3 ordered and pending delivery. I'm for meets or if anyone in the area needs a hand in repairs/upgrades. I have a 2 car garage and 2 large driveways, which is rare here. Should be delivered by Mid Feb.
Last edited by filip123; 12-23-2015 at 01:52 AM. Any new members in Germany? I’m not new to Germany been here since feb of last year but just now noticed this group.. I’m in KTown from FT Polk.. loving my Audi 2006 25th anniversary addition .. even with the problems it gives me類. Would be nice to have a few local wenchers to help with questions and problems.. since European cars are new to me. Im in Sembach. I see a lot of Audis driving on base. KMCC should be filled with them. Where are you located? Oh also, I don’t know if there’s a group. I drove by a B7 S4 DTM, and I’ve seen another B8, couple A3s and S3s but no indication they’re in a group of any sort nor have I found anything online. Clean B7, have you seen a dark blue one? He’s the one I saw. Aftermarket diffuser, carbon trunk lip spoiler, Black Nürburgring emblem on the back, it’s super clean. This is why I want to connect with other folks because if I ever have to buy parts or get work done, I could at least get some input on places. I’m in Stuttgart if anyone ever heads this way and wants to connect let me know and I’ll do the same if I’m up that way. Lived at Ramstein for 8 years, so it’s my old stomping ground. I’ve got to get back from Poland .. if that ever happens.. and man I can’t wait to drive my car through Italy and Croatia.... !! Sounds good! 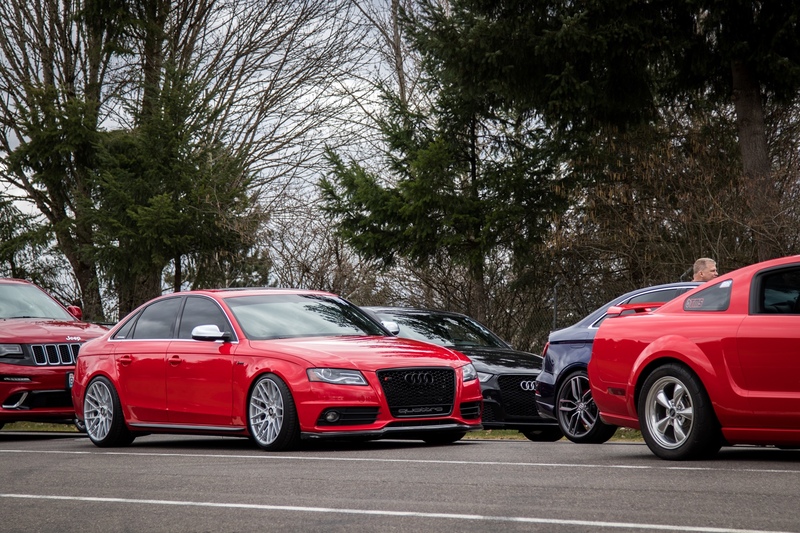 Always cool to talk Audis. Yeah maybe we should try to start a group around this witching the outlying bases share ideas knowledge and new parts and places to go maybe even hit a few car shows they have a lot of them here especially in Belgium.. I passed by one during one of my hockey tournaments but the group of guys I was with didn’t want to stop and check it out so I missed it.. There is an almost monthly cars and coffee during the spring/summer months here in Stuttgart that I normally attend. Next C&C event is 2 Sept... there was one last weekend. The big tuning event was a few weeks ago at the Bodensee. Oh big C&C events, that’d be cool. We have smaller ones here on Ramstein every Sunday between 1100-1300. Was thinking of going today and maybe meet some fellow VAG folks.